Escape from Obesity: Welcome to Oregon! Before I started this ride, when I first read the news article about Fat Guy Across America (Eric Hites), I thought his bike ride was such a great idea that my first thought was, "I wonder if I could ride WITH him!" I knew he was riding on donations and enjoys press, so I thought maybe he would like to ride "together" (with me riding the same amount of miles he rides each day, but at home) and I could feature his story on my blog. Wouldn't that be cool, riding together and inspiring each other? I haven't ever heard back, but maybe by the time he responds I will be biking long and far enough to not be left behind on his daily rides. He's been riding for over a year so I'm sure he's in much better shape than I am and probably rides much farther in a day than I can (7.9 miles in a day is my max so far, but I've only been at this for 3 days. Forgive my short rides as I do have degenerative arthritis in my knees and have to slowly work up to longer rides). Maybe if he is too busy to respond, which is understandable since he is in Boot Camp right now, I can find where he logs his rides and try to copy his mileage. For now I am doing live updates on my rides (miles, time, and speed) at My Virtual Mission: Fat Mom Across America. 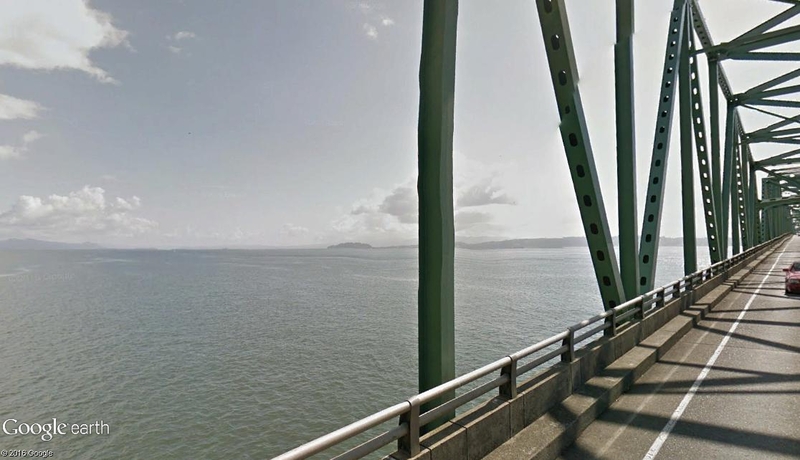 Today I picked up where I left off yesterday: at the Washington end of the magnificent Astoria Bridge! 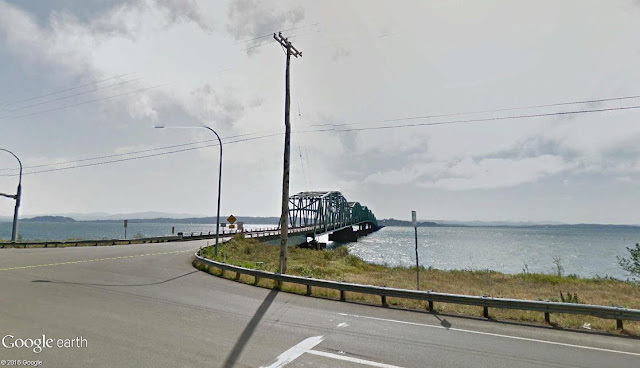 This bridge is over 4 miles long and spans the mouth of the Columbia River, so I had to map out my route to have a ride that doesn't leave me stopping in the middle of the bridge. I wanted to get over it in one pass, so I set off this afternoon (after a busy morning and a lunch of roasted turkey breast, sliced melon, and string cheese). Right after passing from Washington into Oregon (yay! Riding in a new state!) the trusses disappeared and I was riding for miles over this vast stretch of water. My kids have always loved driving over this bridge because the seagulls will come and fly right alongside your car sometimes! 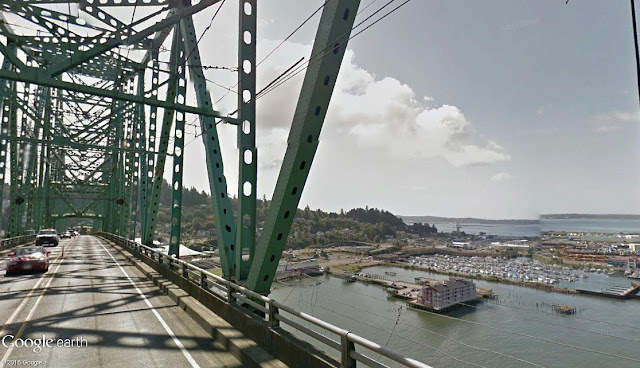 Approaching the other side, there are more trusses and the bridge rises high above the water as it enters the city of Astoria, Oregon. I love the view of all the boats in the harbor. After a brief rest, I got back on the bike and rode another 1.8 miles through Astoria. I saw a familiar sight: Pig 'N Pancake! We always used to stop for breakfast there (and have pancakes, of course) on our vacations to the coast. No stopping for pancakes today. No Pig'N, either. I rode on and stopped near this cool boat near the Columbia River Maritime Museum. Looks interesting! I will have to take my daughter here next time we come through. That's all the riding I am doing for today. I rode a total of 6.2 miles today, which is less than yesterday, but my knees are getting a little sore so I am stopping now, taking some anti-inflammatories and resting up for a longer ride tomorrow. Leave some comments... support the ride! Just flew back home from OR tonight, although I didn't make it to Astoria. Ride on! I'm enjoying your journey. I love your updates! Will you do a weigh in? Thanks, not really comparing, but he was the one who inspired me. I have since looked at more news articles and found his Facebook and I see he has struggled a lot. I watched his live FB feed last night and he said he is getting back on the road soon. I don't judge (well, maybe I judge the taking money part) and am watching to see if he actually does get on the bike and finish his trip. His trip is not what I thought it was, for sure. If he does answer my email I would like to encourage him to work hard and make the rest of his trip inspiring. I love this idea! You are doing awesome!